I’m a little late with the red, white & blue diy projects…..at least for Memorial day……but the Fourth of July is coming up. The fourth is my baby sister’s birthday. She’s nine years younger than me. My birthday is July 6th and after she was born I never had my own birthday celebration. I’m still carrying a grudge. But I digress. I’ve painted furniture, signs, planters, you name it, using red, white & blue or combinations of red and white and blue and white. I’m looking for my next patriotic project before the fourth gets here and I found all sorts of inspiration. 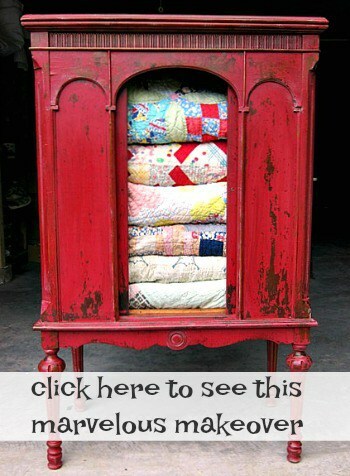 Side note….I’ve been working on the vintage buffet I bought at auction. It’s taken a few twists and turns but I’m finally on the right track. Maybe it will be ready to share tomorrow. 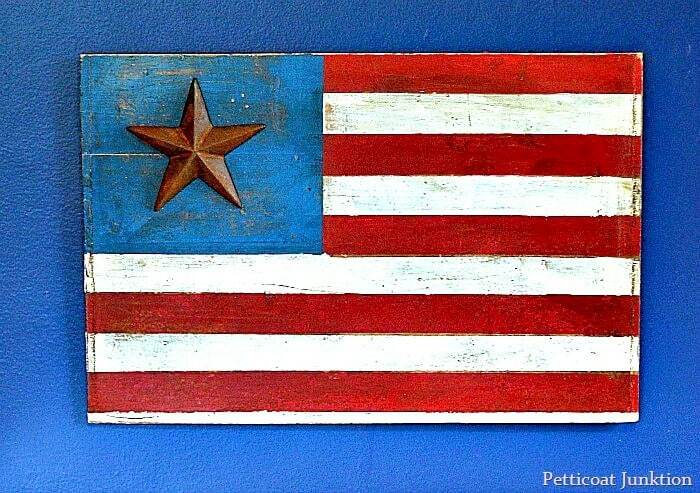 The rustic star flag was easy enough to make because all the stars aligned so to speak. I had a rustic board, painter’s tape, paint, and an iron star. The board ended up being just the right size and the painter’s tape just the right width for measuring…and that’s how the flag came together. 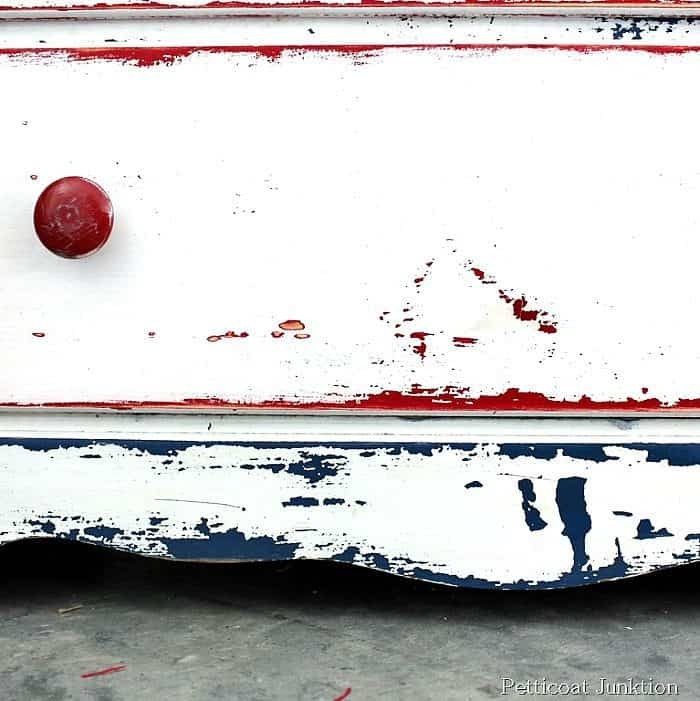 The Red, White, & Blue Chest of Drawers in the photo above was also an easy project. The chest came from the Nashville Flea Market and it was painted white. I could see bits of red and blue peeking through the chipped white paint. A good cleaning, heavy distressing, and newly painted knobs made this piece layered paint perfection. 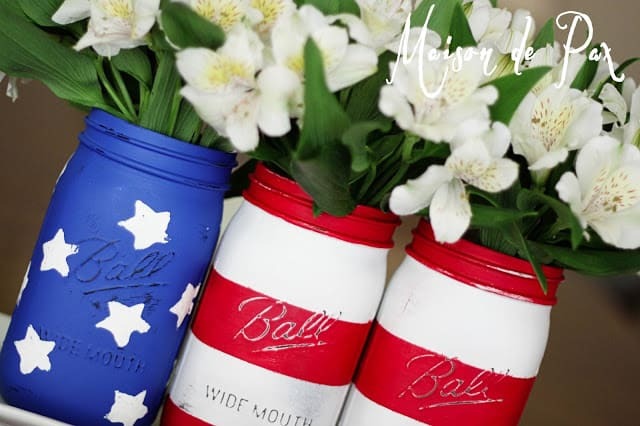 How pretty are these Patriotic Mason Jars. What a striking display for such an easy project. Of course I like anything with a bit of distressing. The Red, White, & Blue Bandana tablecloth is too sweet for words. I have a thing for bandana print. I don’t know why I haven’t done a bandana diy. Maybe soon. Anyway the tablecloth story is a pretty good one. This Patriotic Wreath made with clothespins and wood stars is a showstopper against a dark door. Garlands are easy to make and this Rag Ribbon Garland hanging from the fireplace mantel makes a great display for Patriotic holidays….or anytime. I like Plank Flags and this one is just the right size. The circle of stars is a favorite look too. There is just something about the circle with the stripes……perfect combo. This has to be the most fun of the 16 projects….Festive Kite Garland. They had me at the straws. I never would have thought to use straws on the mini kites. I have a ton of tote bags but I could always use another one. This bag is trendy and perfect for jeans day…..everyday for me. Anyone remember tie dye? It’s making a comeback. The patriotic tie dye shirt would look cute on Miss Sofi. We might have a tie dye day. 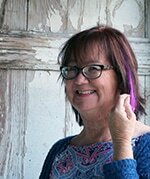 I’m always looking for things to keep her busy although we might end up with more dye on us than the project. You might not call this a diy unless you consider putting together an awesome Fourth of July Display a diy. I call it a diy. Those displays sometimes take a lot of work. 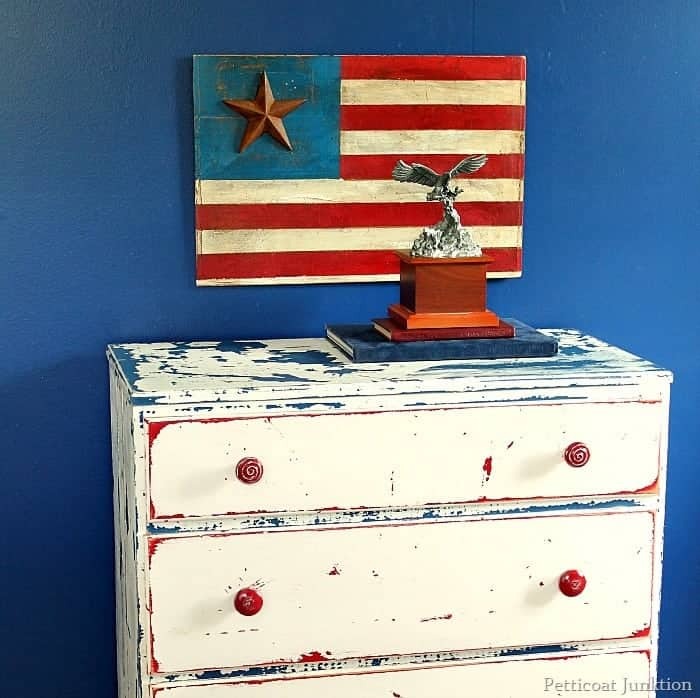 Pam combined vintage finds with new items and they make the perfect red, white & blue display. The reclaimed window with the flag is so simple. Just tack the flag to the backside of the frame. I might try this one without the glass in the window frame. I painted this piece of furniture I long time ago. Back in May of 2013. 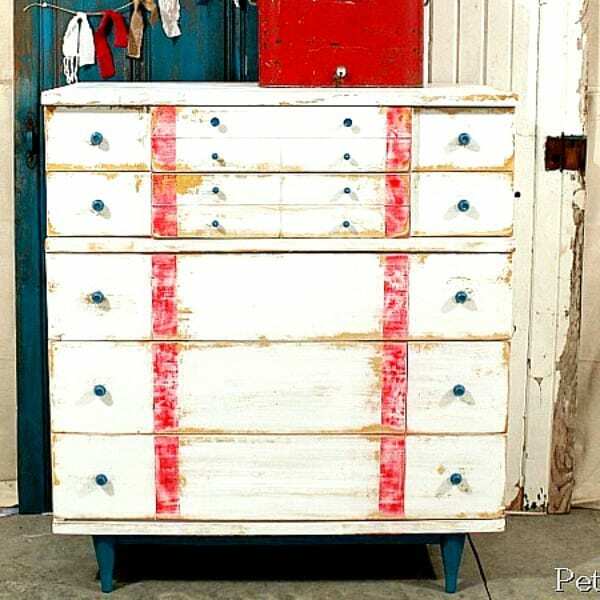 It’s kind of nautical style and definitely distressed to the max. It’s not for everyone. I do like what I did to it and may try the look again with not as much distressing. What do you guys think? Okay, this might be my favorite….Stained Glass Jars. They are seriously pretty and look like a lot of work, but maybe worth it. I haven’t tried the gallery glass paints and to tell you the truth it might not be too hard. Not sure what to make of this DIY Double Suitcase Side Table. Maybe a conversation piece? Definitely different. Lovin it! Fabulous and very well done. I love patriotic decor and you’ve found quite a collection. If you have any old windows hanging around, try a stained glass mosaic – very time consuming but lots of fun! Thank you Terry! Maybe you could email me a photo or post it on my Facebook page when you get it done. Would love to see it. I just want to tell you how much I enjoy your site. Your site is one of about 5 that I never miss reading. I am older now so don’t do as much as I use to but I like reading about your exploits! Blessings to your and your family.